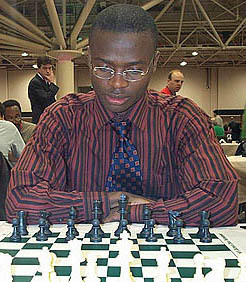 Amon Simutowe has made it known that he is going to make a serious run for his final GM norm. He has released a list of tournaments and hopes that his plan will bear fruit. Having finished his baccalaureate studies he is now applying to graduate programs, but in the interim, he will focus on chess. In a "pre-tour" tournament, he plays against the ever-dangerous Blas Lugo, the Cuban-born International Master in Miami. This game had a number of twists and turns and lived up to its billing. Lugo uncorked a thunderbolt on 15…Nh4!? But Simutowe kept his composure and handled the complications. The game is an absolute thriller. Notes are by Simutowe. "IM Amon Simutowe - IM Blas Lugo"